Customized reusable shopping totes easily let you promote your organization or company because every time a client uses your bag they bring visibility to your logo and marketing message. Custom recyclable bags also make for an eco-friendly marketing tool because they reduce the need and consumption of plastic bags. Since these bags are reusable they will get your logo noticed for years to come. The polyester construction is also recyclable so customers can even dispose of these bags in an eco-friendly way. 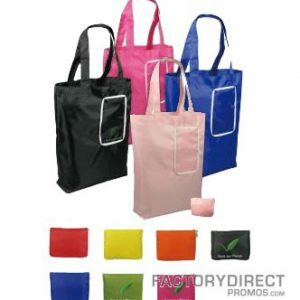 These Fold n’ Go Green snap folding totes come in a variety of colors and can be imprinted with your logo. We imprint our bags right here in the USA so we can fill your order in no time. If you have the time and want something more custom check out our overseas production for additional colors, sizes, and more.